picked off first base by Danny Duffy in the fourth inning. Well, that was a pretty ugly loss by the Twins Wednesday night in Kansas City. Two baserunners picked off. Another runner thrown out at the plate by, oh, maybe 15 feet or so. The moment Brian Dozier took off I was yelling "No no no" at the TV set, and Scott Ullger should have doing the same, because it's possible Dozier could actually hear him. And then I remember the story from the 1975 World Series of Don Zimmer, third base coach for the Red Sox, yelling "No no no" and Denny Doyle hearing it as "Go go go." Meanwhile, another day slips off the calendar toward the nonwaiver trading deadline, and still no action involving the Twins. I do believe something is going to happen before the deadline this afternoon. But I suspect it won't involve Kurt Suzuki or Josh Willingham. Maybe Kevin Correia (teams are always looking for pitching, although Correia is not a playoff-caliber starter). Most likely, one of the middle relievers -- Brian Duensing, Jared Burton and/or Casey Fien. But I have a lousy record on guessing trade deadline stuff. Terry Ryan has done deadline deals, but most years he waits until August and the waiver period. That's when Justin Morneau moved last year. So while I expect something to happen today, I recognize that it might not -- and just because it didn't happen in July doesn't mean it won't happen in August. The word from the New Britain Rock Cats about J.O. Berrios: He's fine. No discomfort today. Nothing to see here. Alrighty then. Let's see when he starts next, and what happens when he does. I hope that's accurate. Hudson Boyd, a high draft pick in 2011 who hasn't risen above Low A ball and has been relegated to relief work in Cedar Rapids, was suspended indefinitely for unspecified violation of team rules. The Twins had four picks by the end of the second round of that draft: Levi Michael, Boyd, Travis Harrison and Madison Boer. I'm not very optimistic about any of them at this point. That might have been more exciting to see than watching the Twins' base running tomfoolery. Jose (or J.O.) Berrios in the Futures Game. Source tells me it was indeed shoulder tightness that forced RHP J.O. Berrios from tonight's start after 48 pitches. We'll see what further evaluation holds for him. But reports that his velocity dropped sharply his last three pitches hint that this may be more than a minor glitch. * When Kohl Stewart went on the disabled list, his shoulder stiffness was deem so minor that no tests were going to be done, and I figured that it was just an excuse to skip a start or two for the 19-year-old. Well, the Twins did bring him to Minneapolis for an MRI and exam by the team physician, and nothing was found, or so the Twins say. There's a bit more than a month to the Cedar Rapids season, and Stewart has topped 80 innings. Last year Berrios threw 103 there (and 13 in Elizabethton) as a 19-year-old, so assuming Stewart gets back in action soon, he will be on track to match that workload. * Let's have some good news of a sort: The Twins just signed an "out of nowhere" guy who throws 100 mph by has somehow eluded scouts for years. Brandon Poulson is 24, which is pretty old for somebody going to Elizabethton. If he's going to make it, he's going to have to climb the ladder quickly. Interesting deal Monday between the Kansas City Royals and Toronto Blue Jays, two teams that have at times led their divisions but have fallen to second place. Well, interesting to Twins fans, at least. It's unlikely to change the standings in any meaningful way. The Royals shipped third baseman Danny Valencia to the Blue Jays in exchange for catcher Erik Kratz and pitcher Liam Hendriks. Despite my title for this post, the trade's not really Valencia for Hendriks. It's Valencia for Kratz with Hendriks as a throw-in. But to a Twins fan, Kratz is an unknown, and Valencia and Hendriks are a couple of guys we once held hopes for. Valencia it a fairly empty .282 for Kansas City. The Royals picked him up during offseason presumably as a platoon option with Mike Moustakas, a high draft pick who has disappointed. Moustakas has been even worse than Valencia, but Ned Yost is apparently as allergic to platoons as Ron Gardenhire, so the platoon notion never went anywhere. The Jays have a bunch of corner infielders on the DL (Brett Lawrie, Edwin Encarnacion, Adam Lind), so they can find at-bats for Valencia, at least until these superior players return. The Royals wanted Kratz as an upgrade on their backup catcher; Brett Hayes has hit .135 in very limited at-bats behind Salvador Perez. Kratz has at least flashed some power in the majors, which is more than Hayes offers. He's an upgrade, but not a significant one. And Hendriks? Well, we're fairly familiar with this from the Aussie: The Jays gave him three big league starts, in which he worked a total of 13.1 innings and compiled a 6.08 ERA. 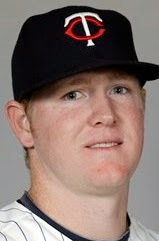 In Triple A, Hendriks is 8-1, 2.33. I really don't know why he dominates in the high minors and is so inept in the majors. He'll be for the Royals what he was for the Jays -- rotation depth in Triple A.
Tom Glavine, Frank Thomas, Greg Maddux and Joe Torre. 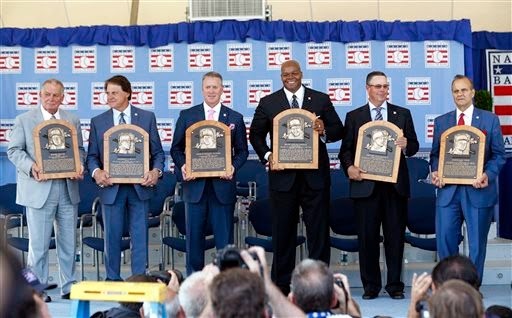 Six Hall of Famers is a lot. And it wasn't enough. This weekend the Hall announced some new rules for the voting. They cut the period for BBWAA voting from 15 years to 10, and in the process pretty much guaranteed that the writers won't induct Tim Raines. Or Barry Bonds or Roger Clemens, either. I think Joe Posnanski nails it in this attempt to divine the Hall's intent: The board wants to keep the 'roid users out, it wants to induct more recent players than the writers will, and it is gearing up to change the selection process. Pos figures -- and I agree --that the sooner the Hall gets Alan Trammell and Raines and a few others out of the writers' jurisdiction, the sooner a "veterans committee" can get them in. Pos lists every player chosen by the writers in years 11 to 15 on the ballot, all 11 of them. There are a few I wouldn't vote for (Jim Rice, for example, was not as good as contemporary left fielders Raines and Roy White), but there are worse players in the Hall than any of them, and Gabby Hartnett, Bert Blyleven and Duke Snider certainly should each have gone in much sooner than they did. The Hall didn't make this limit because the writers are putting unworthy candidates in after year 10. I regard the BBWAA vote as broken. They have too many voters with a tangential connection to the game, if that; they have grandfathered voters who would be ineligible had they started their career in their current medium; they have a counterproductive 10-vote maximum on the ballot. The BBWAA thinks the "Deadspin" crowd-sourced ballot cast by Dan LeBatard last winter is an embarrassment, but ignores the fact that the next president has been crowd-sourcing his ballot for years. The Hall's changes don't address any of those issues. And those are the issues that Posnanski predicts the Hall itself will deal with eventually, because the BBWAA isn't capable of that much rational thought. If it were, Craig Biggio and Jeff Bagwell and Mike Piazza and Mike Mussina and Curt Schilling and Raines and Trammell would all be in. 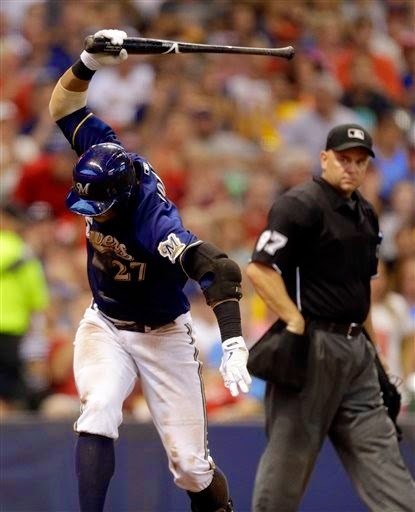 I like the moment captured here -- the bat essentially breaking lengthwise and the ball still in the shot -- but this image also provides the opportunity to comment on Ryan Braun, disgraced superstar. Braun's involvement with performance-enhancers is pretty well known. He flunked a drug test near the end of his MVP season in 2011, wriggled out of the suspension by raising questions about how the specimen was handled, then wound up suspended for the final 65 games of 2013 after being nailed in the Biogenesis probe. and is hitting .298/.349/.529, well below his career norms of .311/.372/.561. On that last point, however, it's worth noting that offense is down all over. The OPS+ measure on Baseball Reference puts Braun at 140, meaning that he's 40 percent above league average. His career OPS+ is 146. This suggests that he's just as good as he has been over the years. 3.43 in Triple A this year. The Twins are in a period in which they are shuffling bodies around to cover for a rotation vacancy and because they're downshifting from veterans to prospects -- or at least unestablished players -- as it becomes obvious that contention remains an illusion. The upshot is that something marginal is happening every day. Friday's move was the demotion of Jorge Polanco -- recalled for a day after Kendrys Morales was traded Thursday for a minor leaguer -- to bring up Logan Darnell, who will get the start Saturday in place of Kris Johnson, who was demoted after Monday's start to make room for Yohan Pino, who started Tuesday. Meanwhile, the true prospect starters -- Alex Meyer and Trevor May -- remain in Rochester. This is a growing irritant to a vocal block of Twins fans, who are wondering why we're getting a parade of minor league vets in Johnson and Pino and not seeing the guys who could actually matter down the road. My guess is that the Twins are (a) wary of May's health after he missed almost a month with a calf injury and (b) unwilling to bring Meyer up with his (unofficial) innings limits. I think -- hope might be the more accurate verb -- that the idea is to bring May in to replace Kevin Correia in the next week or so after Correia is traded. (That, of course, is a scenario that assumes Correia will be traded, which may be merely wishful thinking.) I don't expect to see Meyer in Minnesota at all in 2014. Darnell is sort of a medium ground between the Meyer-May duo and the Johnson-Pino pair: Not as high-ceiling as the former two, younger than the latter two. 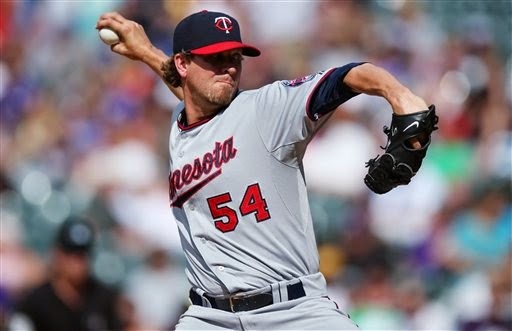 He's a lefty, and I suspect that his ultimate role, if any, with the Twins will be in the bullpen. Brian Duensing 2.0, perhaps. As a starter, Darnell's not staying long. If Duensing is on the trade block -- and a contender may well be interested in him and his 2.27 ERA -- Darnell might stick around for a trial in the pen. Bottom line: Just because Darnell is here today doesn't mean he'll be here tomorrow, and if he's here tomorrow it doesn't mean he's remaining in the rotation. The roster shuffling is far from over. Well, it was an attractive idea at the time: Sign free-agent Kendrys Morales to beef up the designated hitter slot and see if he could give the Twins offense enough of a boost to get them deeper into the playoff chase. On Thursday, the Twins sent him back to Seattle, where he played last year, in exchange for 25-year-old reliever Stephen Pryor. Pryor once threw tremendously hard, but then he got hurt, and the word is that instead of the 100-mph gas he featured before the injury he's operating in the low 90s. He hasn't been particularly effective in Triple A for the M's Tacoma farm team, and I would think that there are other relievers on the 40-man roster (or even off the roster) who should rank ahead of Pryor. I think it likely the Twins will trade away at least one of their established set-up men (Jared Burton, Brian Duensing, Casey Fien), and if so, it will create openings for some of those relievers. One thing for sure: We should not expect this to be the last veteran the Twins move this month (or next month in a waiver wire trade). Terry Ryan signed Morales in an effort to win now; the players simply could not live up to that notion. One aspect of the Morales trade to note: Jorge Polanco, the young Dominican infielder who made a bit of a splash in a brief callup in June, was called up to fill the spot on the 25-man roster. There really is no point to bringing him up to sit on the bench. But I certainly don't foresee either Brian Dozier or Eduardo Escobar sitting for the kid, and Polanco has had minimal exposure to any position other than shortstop and second base. Sorta makes me wonder if there's a trade in the works involving a middle infielder. outing for the Twins came against Cleveland. The last of the Reunion Three got the ax after Wednesday's game: Matt Guerrier was designated for assignment. Ryan Pressly was recalled to take his place on the 25-man roster, and the Twins, for now, have an opening on the 40-man roster. Guerrier ends his second stint with the Twins with a record of 0-1, 3.86 in 28 innings. The ERA had been a pretty sparkly 2.67 before an ugly outing on Tuesday, but that was deceptive. He hadn't had a "clean" outing -- no baserunners allowed -- since June 22, and that was a one-batter appearance. He hadn't had a clean outing of an inning or more since May 28. Ten walks and 12 strikeouts in 28 innings is not a solid foundation. I never saw the purpose in giving Guerrier a roster spot over Pressly or Michael Tonkin, but somebody did. As with the other two retreads from playoff teams past, Jason Bartlett and Jason Kubel, my issue isn't with the player. I do not begrudge a veteran trying to milk another season (or more) from his declining skills. My issue is with the management that could not, or would not, recognize that these guys didn't belong in the majors any more. The Twins will get an extra draft pick next June, having "won" a pick between the second and third rounds in the "competitive balance" lottery. An explanation of the lottery can be found here. Carlos Santana drops one down for a single Tuesday. Top of the third inning, two outs, nobody on. 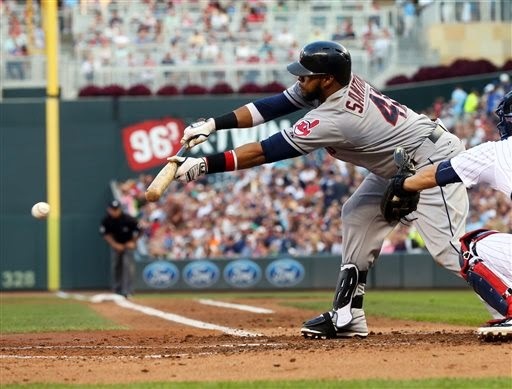 Carlos Santana, the Cleveland cleanup hitter, steps up to the plate against the pronounced shift he typically sees when hitting left-handed and promptly pushes a bunt to the vacated third base position. Later in the game, I am listening to the radio guys, and the Santana bunt comes up. Dan Gladden is almost enthusiastic about the bunt. Santana got on base, he kept the line moving. An unspoken thought in defense of the bunt: Beyond doubt, part of Santana's meager batting average is the heavy use of infield shifts against him. Some bunt singles might discourage teams from shifting. There's merit in both viewpoints. Blyleven's right in this: Santana's three other hits Tuesday (a home run and a pair of doubles) did more to help Cleveland score runs than the bunt did. On the other hand, had Santana lined a single to the outfield, nobody would criticize him for merely getting a one-base hit. Hitting is difficult. Personally, I'm fine with the play. It's not the optimal time for Santana to take a bunt hit (leading off the inning would be), but he's got to do something to get the third baseman back on left side of the infield and open up the right side. And he's got hitters behind him who can do some damage. Getting on base -- not making an out -- is the goal of hitting. Moving beyond this specific case to the abstract: There appears to be a brainless dispute within the game about when it's appropriate to bunt against a shift. Earlier this year, the Houston Astros and Oakland Athletics got into a plunking war that was rooted in a bunt attempt by the A's Jed Lowrie with a 7-0 lead. The Astros responded by throwing at Lowrie. My opinion: If it's appropriate for the defense to put on an exaggerated infield shift -- which are designed to take away singles; no infield shift is going to keep a home run ball in the park -- then it's appropriate for the batter to bunt against that shift. The hitter is under no obligation to cooperate with the defense. Or the pitcher. I know Tom Kelly thinks the shifts are overdone. But they are prevalent in today's game because they work. When enough hitters do what Santana did Tuesday often enough, the shifts will fade. Red Sox, captured in one image. 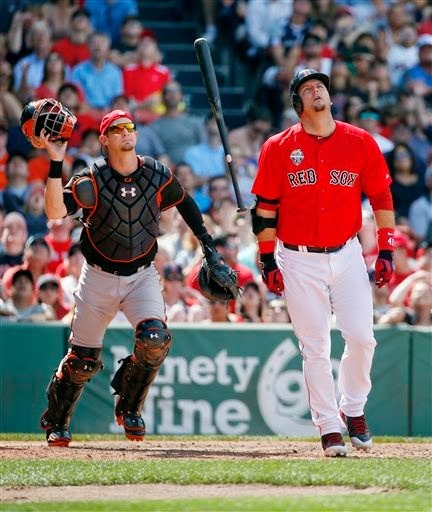 A few days before the All-Star break, the Boston Red Sox designated veteran catcher A.J.Pierzynski for assignment. During the break, the Sox, having determined that there was no trade partner to be had for the remainder of Pierzynski's $8.5 million contract, released him. Roughly a week later, Pierzynski remains eminently available. At age 37, it's not difficult to see way he's had no takers. As a catch and throw guy behind the plate, Pierzynski has never been all that good, especially in the throwing aspect. As a hitter, he's fallen off tremendously with age. A slash line of .254/.286/.348, Pierzynski's stats with the Sox through 70 games, looks pretty good for Drew Butera, but it won't cut it for a below-average defender. It's a pretty good bet that Pierzynski's days as a No. 1 catcher are past. And his reputation as a jerk works against him if he's interested in hanging around as a backup. Still, the Twins were interested enough in a reunion with Pierzynski to offer him a two-year contract last winter (he instead took Boston's one-year deal because he saw an opportunity to chase another ring). Perhaps they've changed their evaluation of him. But I can imagine them deciding that he's an upgrade over Eric Fryer as a backup to Kurt Suzuki -- or even, should they trade Suzuki, deciding to deploy Pierzynski as their main catcher. Either way, I suspect Minnesota represents Pierzynski's best chance of continuing his playing career. I think it's more likely that he'll be behind the microphone than behind the plate. is currently shelved with a fractured leg. The Houston Astros have had the first overall pick in each of the last three drafts. With the spectacular collapse of their negotiations with this year's 1/1 as the team indulged in apparent gamesmanship with its draft pool, it's worth looking at how they've fared with those picks so far. This was a gamesmanship draft by the Astros. Correa wasn't expected to go that high; the consensus had Byron Buxton as the top talent and three college pitchers (Mark Appel, Kyle Zimmer and Kevin Gausman) as safer selections. The Astros took Correa and signed him for considerably less than the Twins, who picked second, spent on Buxton. They then used their bonus pools savings to buy a pair of "tough signs," Lance McCullers Jr. and Rio Ruiz, out of their college commitments. Two years later, Correa is a highly regarded prospect, albeit out for the remainder of the season with a fractured fibia near the right ankle. He's not as highly regarded as Buxton, however, and if the broken leg helps force him from shortstop to third base, his value will recede a bit more. As for the gain downdraft, it's probable that the Twins did better with Jose Barrios than the Astros did with McCullers Jr.
Correa wasn't a bad selection by the Astros, but I think the industry would agree they'd have been better off taking Buxton. When the Astros and Twins bypassed Appel in 2012, so did several other teams, and he slid to the Pirates at No. 8. Pittsburgh didn't have the bonus pool money to appease the college junior, and Appel returned to Stanford. This time the Astros took him (over Jonathan Gray and Kris Bryant), and Appel signed. He has been a disaster. Appel was somewhat less than dominant for Quad Cities in the Midwest League last summer, but it had been a long collegiate season and he was shifting from pitching once a week for Stanford to a more frequent professional rotation. Nobody was concerned. Moved up to high A Lancaster in the California League this year, Appel is 1-5, 10.80. Let me repeat that ERA: Ten-eighty. He's averaging a bit more than three innings a start, and he's allowed 69 hits in 38.1 innings. Lancaster is a notoriously terrible place to pitch, but there is no sugarcoating those numbers. The Astros would have done better to take Bryant, certainly. At this point, they'd have done better taking anybody else. It's difficult to envision a four-year college pitcher doing this poorly in A ball and having a career. Appel may not be what the Astros (and, to be fair, most everybody else) expected, but at least there's a chance he will contribute someday to the Astros. Aiken will assuredly not. Whatever the specifics of the medical concerns, whatever the perceived risk, it is baffling that the Astros front office screwed up the negotiations this badly. And, of course, it wasn't just Aiken they lost, but Jacob Nix as well. I doubt that general manager Jeff Luhnow is in any real jeopardy over this, but there is a serious case to be made that this should a firing offense. Houston will get the No. 2 pick next June in compensation for failing to sign Aiken. The Astros don't deserve it. pulled from his final All-Star Game. Well, yeah. Derek Jeter. Of course he's the pic of the week. The All-Star Game was the event of the week, and he was the focus of the All-Star Game. He's not the best shortstop in the American League this year, but he's not the worst either. He's not the greatest shortstop in baseball history -- that remains Honus Wagner, as it has been for a century or more -- but I think he's the second best shortstop. A great player who somehow manages to be at once both overrated and underrated. Tuesday was a good day to appreciate him. The current regime of the Houston Astros has a tendency to come off as convinced that they're the smartest guys in the room -- and more than that, they frequently seem compelled to make sure everybody else knows it. Today, with the first overall pick in the draft lost to them -- and their fifth round pick too, and, although this is perhaps a bit more of a stretch, their 21st round pick -- they look considerably dumber than that. The Astros on Friday lost two prime prospects, maybe a third, in a dispute over a medical evaluation and, depending on which offer we're talking about, $3 million to $1.5 million. Now, $3 million is a life-changing sum for most of us, but teams toss that much money overboard routinely these days. The Red Sox dumped A.J. Pierzynski last week; they will pay him more than $3 million not to play for them. The Astros, if we take their reported concerns about Brady Aiken's elbow at face value (and Aiken and his camp emphatically do not), were willing to risk more than $3 million on Aiken, even $5 million, but not the agreed-upon $6.5 million. This flabbergasts me. Five million is the same amount the Twins are wasting on Mike Pelfrey this year -- and will spend again on him next year. The Astros couldn't bring themselves to wager less money on Aiken's future than the Twins did on Pelfrey. Major league play resumes today after a four-day All-Star break. Here are a few links that might inform and/or entertain you in the meantime. * I had my (usually) biweekly chat with KMSU's Jim Gullickson on Monday. It was actually the first time I'd been on the air in three weeks, but we'll get back in rhythm now. Second and fourth Mondays of the month, 1 p.m.
* Here's a lovely piece by the great Joe Posnanski on Glen Perkins and his All-Star experience this year. 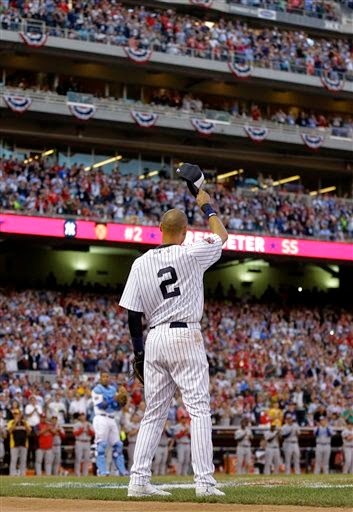 Then the truck turned onto 7th and it stopped, and there were a lot of people there, thousands of people, and the cheers pushed up to 11, pushed to a sound Glen had heard before -- the sound he had heard for Mariano Rivera. Only this time those cheers were for him. Surreal. * Today is also the deadline for signing 2014 draft picks, and there is a bizarre late drama coming to a head between the Houston Astros and the No. 1 overall pick, Brady Aiken. To understand it, here's Ken Rosenthal's piece from earlier in the week that exposed the dispute to public view, and here's a Fangraphs piece that tries to make sense of it. I have an opinion about this one, but it's really more of a bias. I have, with no real evidence to support it, a sense that the Astros are not a trustworthy operation. I don't know that they're trying to cheat Aiken; as Mike Pietriello says in the second piece I linked to above, cheating Aiken doesn't make any logical sense. I just don't trust them. But I do think the Astros will sign Aiken today, and Jacob Nix, the fifth-round pick whose contract agreement is in limbo because of this dispute, as well. I can't see that the Astros are dumb enough to lose both players. And if this thing goes completely haywire, it's possible that the 'Stros will not only lose Aiken but their first-round pick next year (if Nix is ruled to have a valid oral contract at a number that pushes the Astros over their bonus allotment). There's too much at risk for the Astros; they have to sign these guys. But they sure seem to be trying to screw this up. Trevor May came off the disabled list for the Twins Triple A affiliate in Rochester, and to make room, Scott Diamond was released. I am admittedly a Diamond fan, but I can't argue with cutting him loose. He fared ill this year in Rochester. A 6.52 ERA is a long way from getting it done, and 10 homers in 80 innings is too many for a guy who lives on the ground ball. There were, by the end, a lot of pitchers in the upper levels of the farm system ahead of him. The Twins got a good year out of Diamond in 2012, but even that year, his low strikeout rate was an ominous sign of what was to come. As I noted during his 2013 struggles, for him to succeed, it wasn't enough to be good at his strengths. He needed to be the best -- the best at getting ground balls, the best at avoiding walks. He was merely a bit above average at those things last year. And it wasn't any better this season. The Cincinnati Reds have already signed the lefty to a minor league contract. Maybe Diamond, who's only 27, can revive his flagging career with the Reds. I'll be rooting for him. this season, but this celebration was for the All-Star Game. 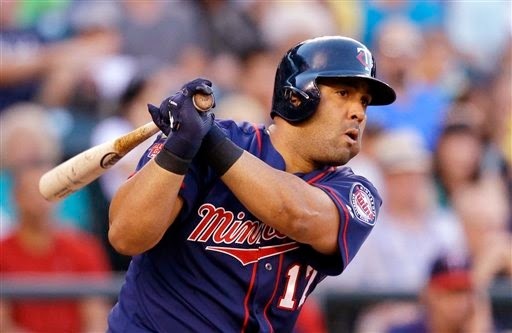 Two native Minnesotans, both of whom came up to the Twins in 2006. Pat Neshek had the more immediate success. Then he got hurt, had a falling out with the organization, was waived, bounced from franchise to franchise, suffered a horrible family tragedy, and now, suddenly, has re-emerged as a bullpen force. He was named to the NL All-Star team ... and took the loss Tuesday night. Glen Perkins, who had a bit role in 2006, claimed a spot in the starting rotation in 2008. By 2009 he had pitched his way out of the rotation. 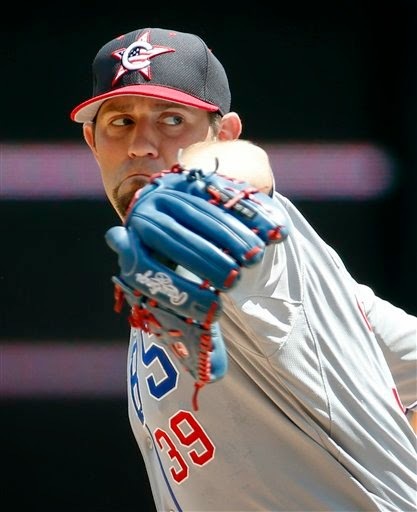 By 2010 he was in the organizational doghouse and barely topped 20 major league innings. A lot of us expected him to go the way of Neshek, discarded as more hassle than he was worth. Instead, he patched things up with the front office, embraced a bullpen role, was pretty much the one bright spot to the 2011 season, and now is the closer and a two-time All-Star. And on Tuesday, he got to close out the American League's win in his home park. Two native Minnesotans, two All-Star bullpenners, two different travels from the same crossroads. Derby, he's in it to win it. My interest in the Home Run Derby is seldom very high, and once Brian Dozier and Justin Morneau were eliminated this year the "competition" became background noise while I worked on a Facebook photo album from our vacation/minor league trip. Still, I picked up via Twitter a sense that the new, supposedly quicker, format for the Derby was unsatisfying. Part of the disgruntlement, I suspect, is that the biggest power stars in the competition, Joey Batista and Giancarlo Stanton, lost out in the semifinals. Part of it, I suspect, is that Target Field is not an easy home run touch, so we got some 1-0 scores in swingoffs and matchups. And part of it, to be sure, is that my Twitter feed is heavy on the kind of serious fans who are at their core a little embarrassed that they care about the spectacle that is the Derby. Still, Yoenis Cepedes won for the second straight year, so I'm not inclined to think the format resulted in an undeserving champion. Cepedes, it appears, is a batting practice monster, and Home Run Derby is glorified batting practice. I was intrigued earlier in the day by a SportsCenter segment on why Target Field is a difficult home run part. Their "Sports Science" report noted that the posted dimensions of the yard are actually a little shorter than the major league average, but the stadium has proven over its four-plus seasons of use to be one of the more difficult home run parks in the majors. Their analysis focused on the wind. It concludes that the summer wind generally comes in from right field -- through the Twins Plaza opening into the stadium. The wind is funneled into the Plaza by the tall buildings surrounding the park, and turns into mini-cyclones when it clears the seating area and reaches the lower field. This helps knock fly balls to right down. starting pitcher for the World team Sunday. I am enough of a prospect nerd that the Futures Game is more interesting to me than the All-Star Game itself. Futures Game. "Run" is a generous term. I'd like to see the Futures game moved to prime time, with all the regular season games on that All-Star Sunday played in the early afternoon. But that's just me. My wife and I attended the Futures Game Sunday and ducked out before the "Celebrities and Legends" softball game. And I did notice a number of empty seats in my section filling in the last couple of innings of the Futures Game. I do know this: As long as the softball game is a bigger draw than the Futures Game, what looks to me to be a flawed schedule will never be repaired. 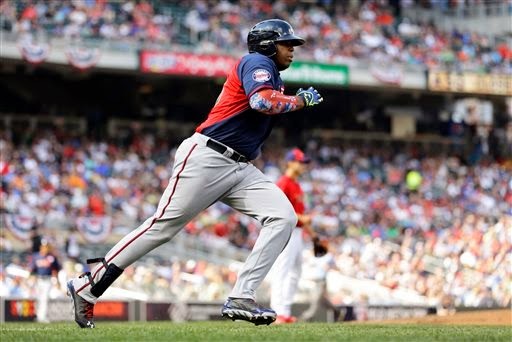 The Twins provided three of the 50 players in the Futures Game: Pitchers Jose Berrios (who started for the World team) and Alex Meyer (U.S) , and first baseman Kennys Vargas (who hit cleanup for the World). All three performed well. Berrios tossed a perfect first inning (no pitchers work more than an inning in this game), showing a fastball in the mid 90s and a breaking ball some 15 mph slower. Vargas drilled a double in his second at-bat and played a clean first base as one of the few players who went all nine innings. And Meyer needed just four pitches to get three outs in his inning of work. Baseball America named Meyer's the best fastball of the contest, noting velocities of 97, 97, 98 and 97. How quick was Meyer's outing? Tom Kelly: "Meyer came in, I turned around to write the change on the lineup card, and when I turned back, he was walking into the dugout." All told, not a bad showing at all -- especially considering that the two best prospects in the organization weren't there. 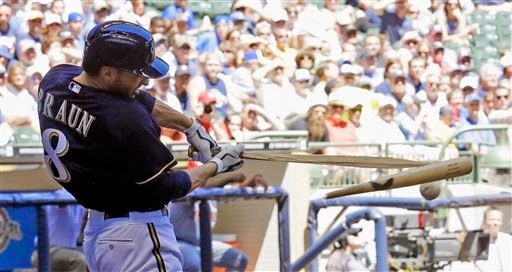 Maybe Carlos Gomez would do better if he held the bat on the other end, huh? so his antics stand out more. coaching first base during my visit. The Cedar Rapids Kernels take their home field to a song whose lyrics promise: And the world's gonna know your name. In truth, even if Kohl Stewart matures into Jim Palmer, there will be millions of people who won't know the difference. And the bulk of the players in the Midwest League will never even reach the major leagues, much less become stars. This is particularly true of the 2014 Cedar Rapids Kernels, a sub-.500 team in a low A league. As I said in an earlier post, there's aren't a lot of prime prospects among the position players. This team is all about the pitching. There are a few guys of interest. "Jim Crikket," the CR blogger whose Knuckleballs blog is linked to on the siderail, is very impressed with Engelb Vielma, a scrawny 20-year-old shortstop who sustained a concussion in a collision with an outfielder a few days before I arrived. I did notice Vielma in spring training, particularly as the second base partner to Jorge Polanco when Tom Kelly and roving instructor Sam Perlozzo were working Polanco as a shortstop on a side field. I figured at the time that Vielma was just there to give Polanco a second baseman to work around and with on double play drills. It's entirely possible that the Kernels have some bats bigger than Vielma, but Crikket loves his defensive range and says Vielma, after not hitting at all in April, has started squaring some balls up. There's not a lot of evidence in the stats to suggest that Vielma will hit, but Crikket tells me the Twins brain trust thinks very highly of the kid. better hitter than receiver right now. Mitch Garver, a catcher, was one of three backstops the Twins took in the first nine rounds of the 2013 draft. Stuart Turner, the third-rounder, is playing for high-A Fort Myers and sixth rounder Brian Navarreto is at Rookie ball Elizabethton. Garver, the ninth-rounder, is in between. Garver hit cleanup in all three full games I saw, and he's hit quite well. His defense behind the dish apparently leaves something to be desired, however. There are probably good things to be said about Chad Christensen, a first baseman-corner outfielder, and Alex Swim, another catcher who's getting considerable time in the outfield, but both are a bit old for the Midwest League. So is Garver, for that matter. All of them are 23. This team has a lot of college guys for a Midwest League team, and several of them -- Christensen and Swim fit this description -- were signed after their senior seasons, not their junior seasons, as is common among collegians. It's not a promising sign to have a lineup whose most productive hitters are old for the league and still be sub-.500. The single most important player on the Cedar Rapids Kernels is Kohl Stewart, the No. 4 overall pick in the 2013 draft. I made the trip to Clinton's 1930s relic of a ballpark Friday to see the kid pitch. The limits show in Stewart's record: He averages less than five innings a start, which makes it very difficult to pick up the win. His ERA is 2.58, but his won-loss record is 2-5; you can get a loss in a four-inning start, but you can't get a win. He had no problems with the limits Friday. Stewart went six innings, allowing one run on six hits. He didn't walk anybody, and struck out five. He has a very compact delivery; even in the windup, the right knee doesn't come close to waist level, and the hands don't rise above the chest. There's even less motion in the stretch; the slide step seems to come naturally to him. Nick Burdi's is a maximum-effort delivery. through. (Photo by Linda Vanderwerf). Unlike the (generally) more up-to-date Cedar Rapids yard, the Clinton park displays radar gun readings. Stewart touched 95 at least twice, but he generally worked his fast ball around 91 mph. The higher-velocity stuff tended to get hit pretty hard, actually; he got most of his outs, and certainly most of this third strikes, on offerings in the mid to upper 80s, either sliders or two-seam fastballs. He got eight outs on ground balls, five on outfield flies and five on strikeouts. One of the hits off him came on a bunt. He made a very nice defensive play himself, coming off the mound to field a tapper on a short hop and take it to first himself for the out. 93, 97, 97, 88 (strikeout); 98, 96, 97, 89 (strikeout); 95, 89, 97, 96 (strikeout). Overwhelming stuff, to be sure, with the three high-80s offerings being wicked sliders. I don't think the three hitters Burdi faced even mustered a foul ball. The word on Burdi around draft time was that he could be fast-tracked to the majors. I sure didn't see anything to contradict that assessment. It's not likely that the Twins would do that, but they could. Thursday's starter for Cedar Rapids was Chih-Wei Hu, a 20-year-old right-hander from Taiwan making his first appearance in a full-season league. Hu had a rough introduction to the Midwest League. The Kernels committed three throwing errors in the first inning. One of them was his; the others came from the third baseman and the left fielder. Hu gave up three runs on four hits and all those errors in the first inning, all the runs unearned. And that was pretty much all he gave up. Hu followed that first inning with five scoreless frames, allowing just one more single and walking one. He struck out five. In comparison to Ryan Eades, the pitcher the previous night, Hu didn't display the top velocity or the slow speeds that got Eades nine strikeouts. He also gave up fewer hard-hit balls. Hu pounded the strike zone and worked a full inning deeper into the contest. And the Kernels somehow managed to win a game in which they committed five errors. The Twins gave Hu a $220,000 bonus when they signed him in 2012, so they have a bit of an investment in him, but he isn't a truly high-profile prospect. Just eyeballing the Kernels roster, I can pick out at least seven pitchers who got bigger bonuses. Which is fine. It takes a lot of pitchers for an organization to find one viable major leaguer. There's a ghastly attrition rate at this level of the minors. Hu has a long way to go to beat those odds. Thursday was a step in that direction. I am spending a few days in Iowa taking a look at the Cedar Rapids Kernels, the Twins Midwest League (low A) affiliate. The talent is in the pitching staff, and those pitchers are not getting much support. A case in point would be the hurler I saw Wednesday night, Ryan Eades. Eades was Minnesota's second-round pick last year, a right-handed pitcher out of Louisiana State. On Wednesday he went five innings, allowing six hits and five runs, all earned. I promise, he pitched better than that line. He struck out nine men and walked just one (the last batter he faced). Two of the hits were bunt singles. The first three runs scored when the Cedar Rapids center fielder made an ill-advised dive for a single; it got by him and went to the wall for an inside-the-park home run. The other two runs scored after Eades left the game. Nine strikeouts in five innings is pretty impressive. He entered the game with a K-rate of 7.5 strikeouts per nine innings, so this was far above his usual performance. Eades throws with some velocity, and got several of the strikeouts with off-speed pitches located around the knees. On the bad side: He didn't get off the mound well for defense, which might have been part of the problem on those bunt singles, and I didn't like his body language when his third baseman booted a grounder. There were two bases stolen on him, both easily, and it wasn't for lack of effort on holding the runners. Lots of pickoff throws, plenty of slide steps, but he couldn't stop the runners. Eades took the loss in a 5-2 game. He's 5-9 with an ERA of 6.54, which is pretty ugly. What I saw in this one game says he's better than that. his stock has risen this season. Even though Byron Buxton had played just five games this year at the time the list was drawn up, he remains the top guy on the list. Even though Miguel Sano hadn't played at all, he's still in the top 10. And this should not be any surprise whatsoever. Baseball America doesn't include the guys on major league rosters for the midseason list; that takes out the likes of Xander Bogearts, Gregory Polanco and Oscar Traveras. They also skip the 2014 draft picks. Carlos Correa has a broken leg, so if you want to downgrade Buxton and Sano for injury, you have to downgrade Correa also. Basically, the prospects who could arguably be ranked ahead of Buxton are either already in the majors or themselves injured. BA listed five Twins prospects, Buxton (No. 1), Sano (9), Jose (or J.O.) Berrios (27), Kohl Stewart (30) and Alex Meyer (32). It's the order of the three right-handed pitchers that intrigues me. The wintertime lists typically had Meyer ahead of Stewart with Berrios trailing not only those two but, in some cases, Eddie Rosario and/or Josmil Pinto. Berrios was outstanding in high A ball; now the 2012 supplemental round pick gets to test his skill against Double A hitters. Stewart is holding his own, or a bit better, in low A. Meyer has been up and down at Triple A, and I infer that he's slipped behind Berrios and Stewart on the continuing question of the quality of his command. Ranking Meyer 32nd is hardly dissing him. He was raked No. 45 by BA over the winter, after all. I'm more inclined to view the reordered ranking of the three pitchers as a good sign regarding Berrios than as a red flag on Meyer. So the Twins have put him on the disabled list and called up Chris Herrmann, catcher-outfielder. This gives them an extra bench player for the weekend series in Colorado, where there will be no DH (National League rules). It also thins out the pitching staff for a series in Colorado, where pitchers are known to struggle. The debate over whether Nolasco should have told the Twins his elbow hurt or if the team should somehow have been more proactive reminded me of 1988, when Bert Blyleven had a miserable year (10-17, 5.38) and finally went on the disabled list in late July. Sorry to read about Nolasco put on the 15-day DL. I know 1st hand it's not easy to pitch with a sore elbow. Good luck Ricky. Heal quickly! I remember thinking in '88 that Blyleven wasn't helping the team by hiding the injury. But, at least from this distance, I'm not sure the alternatives on hand would have been any improvement. The Twins that year got career years from Frank Viola and Allan Anderson; every other starter, including Blyleven, was pretty awful. This year, the Twins have a very good rotation working in Triple A. The alternatives are better than in '88. And the upside of Nolasco is not comparable to the upside of Blyleven. Brian Dozier was named to the AL squad for the Home Run Derby, to be held Monday at Target Field. There's no requirement that a home team guy be in the derby, but you may remember how Robinson Cano was booed a couple years ago in Kansas City for not selecting a Royal (specifically Billy Butler). Anyway, Dozier will be taking part, and apparently he had already recruited his brother, who pitched in college, to throw to him. I don't know; if by some stroke of luck one of my brothers were in the Derby and asked me to pitch to him, I'd probably accept just to knock him down. But my sibling dynamics may not be normal. There's one more participant for each league to be named, and the word is that Justin Morneau has told NL captain (and Colorado teammate) Troy Tulowitzki that he won't accept unless he makes the NL All-star team. Right now, he's one of the Final Five candidates, and was reported on Tuesday to be in the lead. If Morneau is in the Derby, he might get a bigger hand from the Target Field crowd than Dozier. In the immediate wake of Miguel Sano's Tommy John surgery, there was speculation that he might be able to DH in the minors in August. That has been ruled out. Miguel Sano has been ruled out from games until December. Will be in "controlled environment" until then, per Rob Antony. So no minor league play for Sano, no Arizona Fall League, maybe winter ball in the Dominican. It's a conservative approach; it may be a wise approach; it is, definitely, a patience-testing approach. regular starter in the majors. After Sunday's Nolasco fiasco, Ron Gardenhire insisted that Ricky Nolasco was not injured. Before Monday night's game in Seattle, the Twins announced that their $47 million pitcher was returning to Minnesota to get an MRI on his right elbow, which has apparently been bothering him all season. This development was predicable. I gave a few reasons in Monday's post to suspect that Nolasco was hurt -- a decline in velocity, an avoidance of breaking balls -- and just from a performance standpoint, one had to wonder. I am not surprised that Nolasco continued to take the mound with pain. Nor am I surprised that he waited to reveal the issue until it was obvious he was going to be pulled from the rotation. Any pitcher with 1,300 major-league innings (which Nolasco had on his resume when he signed his four-year deal with the Twins) can be presumed to have some kind of arm damage. 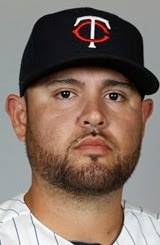 Nolasco is getting the big money because he has a track record of eating innings. He's going to get the $47 million even if he blows the elbow out; as long as the Twins think pitching him will help the team, he's going to take the ball. Maybe Nolasco was asked and denied any injury -- in which case, what can anybody else do? Can't DL a guy who says he's not hurt. It finally got to the point where Gardenhire decided pitching Nolasco does more harm to the team than good, and then Nolasco fessed up. 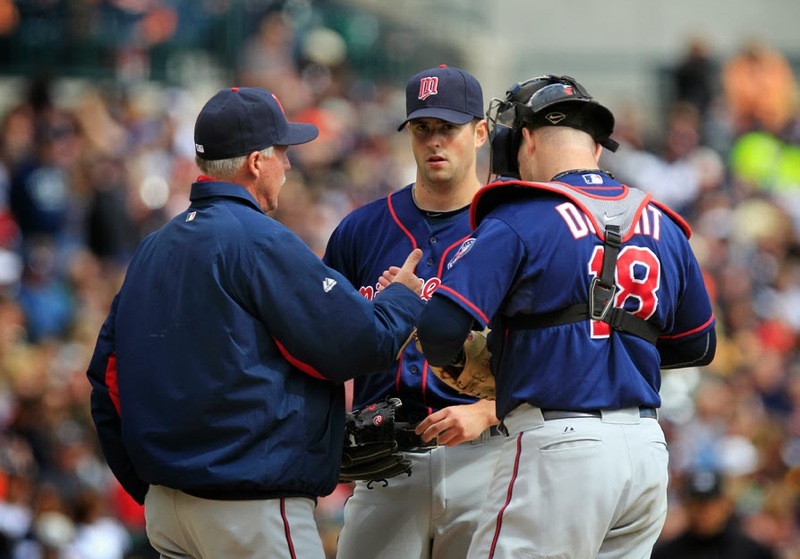 Gardenhire reasonably relies on players to know, and to admit, when their bodies can't handle the task. It appears that the fans (and some in the media) deploy a double standard: Rip the player who says he can't go, rip the player who tries to play hurt and fails. * Trevor May has indeed been scratched from the Futures Game, as LaVelle Neal predicted Sunday. Alex Meyer has been named to the USA team in his stead. Inasmuch as the Futures Game is intended to feature the best prospects, regardless of how close to the majors they are or the comparative quality of their season stats to date, Meyer is a better match for the spirit of the game. May is more likely to pitch in the majors this year; Meyer is the better prospect. *Miguel Sano was cleared this weekend to begin throwing, a necessary milestone in his recovery from Tommy John surgery. It seemed pretty obvious Sunday from Ron Gardenhire's postgame comments that Ricky Nolasco is coming out of the starting rotation. This can't be much of a surprise to anybody. Nolasco's ERA, after surrendering six runs in two innings Sunday, is now an ugly 5.90, and he leads the league in hits allowed and runs allowed. The Twins have made a heavy investment in him -- four years, $49 million -- and it is not paying off. Sometimes when Gardenhire makes statements like that, the decision has already been made. So why not just say he's pulling Nolasco? Probably because there are discussions to be had -- not about if to do it, but how. Gardenhire would want to talk to Nolasco about it before telling reporters. He'd likely want to talk with Terry Ryan, and certainly with pitching coach Rick Anderson, about rotation alternatives. Shift Deduno to the rotation? OK, how does that affect the bullpen, especially after a pair of two-inning starts this weekend? Do the Twins need another arm? Gardenhire denied Sunday that there are any physical issues with Nolasco, but I'm not completely buying that. Dan Gladden was talking on the radio about Nolasco's fastball velocity being down. Ron Darling and Cal Ripken, calling the game on TBS, speculated that Nolasco is injured based on the paucity of breaking balls. Remember, as I wrote last winter after the Twins signed Nolasco, he doesn't throw his fastball nearly as often as most major league starters. If he's now relying heavily on the fastball -- and the fastball is of lower velocity than usual -- it does suggest that something is wrong physically. OK, on to the good news. *Byron Buxton played Sunday for the Fort Myers Miracle, going 0-for-2 and making, according to the Miracle's radio announcer's Twitter feed, a spectacular catch. He was only in the game for three innings, which was the plan. * Kurt Suzuki and Glen Perkins were named to the American League All-Star team. Former Twin Carlos Gomez will start for the National League, and ex-Twin reliever and Minnesota native Pat Neshek, having a huge year with St. Louis, was named to the pitching staff. * Justin Morneau is one of the "Final Five" up for a online fan vote between now and Thursday. Details at mlb.com. I normally don't care too much about such things, but I would love to hear the Target Field reaction to Morneau coming to the plate in the All-Star Game. * J.O. Berrios, who has dominated the high A Florida State League, has been promoted to Double A New Britain. Berrios is to pitch for the World Team in the Futures Game at Target Field on July 11. And the Twins might have to pull Trevor May from the Futures Game because his right calf strain is not healing as hoped. Something about this image just made me smile. Maybe it's the goofy sunglasses. Maybe it's the ear-to-ear grin. Maybe, even, it's the background, which so perfectly complements his attire. of his nine-year career so far. Billy Beane's Oakland A's and the Theo Epstein-led Chicago Cubs each have a plan, and the trade that leaked out Friday night — expected to be completed today — makes those plans quite obvious. The big trade reportedly will send established starters Jeff Samardzija and Jason Hammel to Oakland in exchange for the A's two top prospects, shortstop Addison Russell and outfielder Billy McKinney, plus starter Dan Straily. Beane is clearly going for it -- it being the World Series title that has eluded the "Moneyball" general manager through two multi-year contention cycles -- and the Cubs intend to construct an imposing lineup with pitching as a lesser priority. Start with the A's, since it's clear what they're getting. Samardzija is a top flight arm, due for free agency after the 2015 season. Hammel is more of a journeyman; this is his ninth season in the majors, and he has never tossed even 180 innings in a given year. But in this relatively thin mid-season trade market, Hammel was probably no worse than the third-best available starter, behind Samardzija and (probably) David Price of Tampa Bay. Beane adds two starters with ERAs of 2.83 (Samardzija) and 2.98 (Hammel) to a rotation that already has Scott Kazmir (2.61), Sonny Gray (3.08), Jesse Chavez (3.23) and Tommy Milone (3.79). And suddenly the loss of two 2013 stalwarts, Jarrod Parker and A.J. Griffin, don't seem to hurt too much. As for the Cubs, they land yet another budding star shortstop in Russell, who figures to be major-league ready by the end of the year, plus the very young McKinney. for their rebuilding project. Even Straily, who has worked 230 innings for the A's, is only 25. I do wonder, a little, how the Cubs will deal with all these shortstops. They have Starlin Castro, with two All-Star games on his resume, at the position now, and he just turned 24. Russell and Javier Baez are both in the high minors; a position switch for Baez has been rumored for a while, but Kris Bryant would seem to have an inside track on third base. Russell, Bryant and Baez are all consensus Top 10 prospects. One of Baseball America's writers tweeted Friday night that this trade makes it certain that the Cubs have the richest farm system. The challenge will be forming that talent into a usable roster. against Kansas City this week. Back at the start of the season, I was not impressed with the maneuvers that brought Eduardo Nunez to the Twins. Half a season and 82 Nunez at-bats later, his addition looks a lot better than I reckoned it at the time, which means that he not only hasn't fallen on his face but has thrived in a superutility role. Nunez has seen time in the outfield, third base, shortstop and designated hitter for the Twins — and has hit. I remain skeptical about his bat. Eighty-seven plate appearances don't outweigh the previous 827. He was a below-average hitter with the Yankees, and I don't know of any real reason to think that's changed. One point I made in April was that, in a very roundabout way (there's a gap of a couple of years), the Twins and Yankees essentially traded Nunez for Yangervis Solarte. 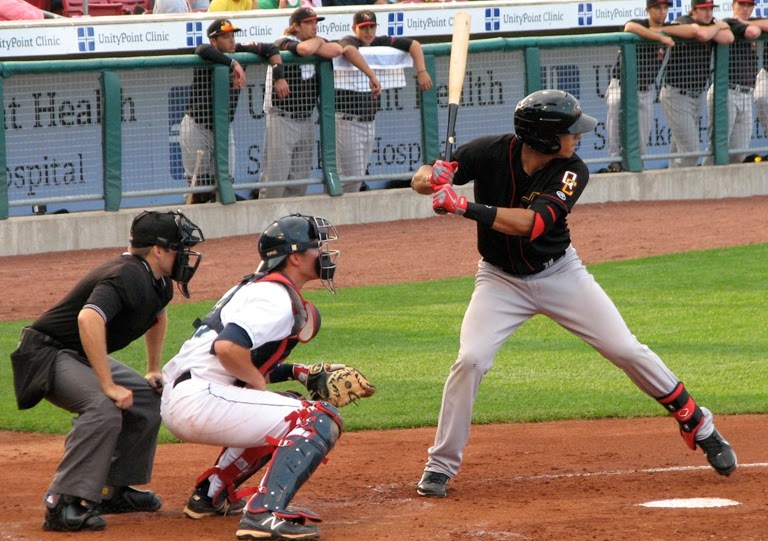 Solarte spent years in the Twins farm system, but even after he hit .329/.367/.466 in Double A in 2011, the Twins didn't deem him worthy of a spot on the 40-man roster. Solarte then spent two years in the Texas organization without a sniff of the majors, signed with the Yankees as a minor league free agent, beat out Nunez for an infield job in spring training, took over third base in April with a hot start ... and fell off a cliff in June. He hit .303 in April, .296 in May and .164 in June, and he gets to start July in the minors. Nunez, who spent most of April in the minors with the Twins and two weeks of June on the disabled list, is suddenly seeing considerable action at shortstop. He started all three games against Kansas City at short, and had a couple starts there last month just before his injury. I'm even more skeptical of Nunez as a shortstop than I am of him as a hitter. His defensive shortcomings were notorious among Yankees fans, and they were comparing him to the rangeless aged Derek Jeter. But Eduardo Escobar's hitting has slid in recent weeks (predictably), and Danny Santana is injured. The Twins are going nowhere in the standings; it doesn't hurt to take a look at Nunez as a shortstop, even if we should already have a pretty good idea of what we'll see. Foreign players: Ready set, sign! Wednesday was the first day the 2014 class of non-draft eligible players could sign, and there was quite the rush. Jean Carlos Arias, left-handed hitting outfielder, also of the Dominican Republic. They are both 16 years old, so there's no point in expecting anything immediate out of either. That's the general rule with the non-draft signings. They are typically very young and very raw. Ynoa has an interesting background. His brother Michael holds the record for largest bonus given an undrafted free agent; Michael Ynoa hasn't come close to the majors yet, but the Oakland A's put him on their 40-man roster to keep him from getting snatched up in the Rule 5 draft. He has, for the second straight season, an ERA above 7.5 in high A ball. We can guess the Twins hope little brother can do better than that. Ned Yost tries some deep thinking. The Twins had the U.S.-Belgium World Cup game on the outfield video board Tuesday afternoon, and somebody asked Royals manager Ned Yost if he was following the giant global futbol tourney. He came up with an answer so breathtakingly inane as to call into question his capacity for logic. 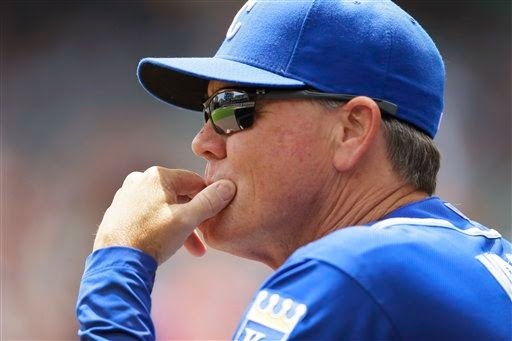 #Royals manager Ned Yost refuses to watch soccer because "the game's too long." Of all possible complaints, this is probably least popular. "The game's too long." This of World Cup soccer — a game whose regulation length is 90 minutes of running time — from a major league manager whose team seldom completes a regulation game in less than 180 minutes. Seriously. There is no requirement that Ned Yost care about soccer, of course. 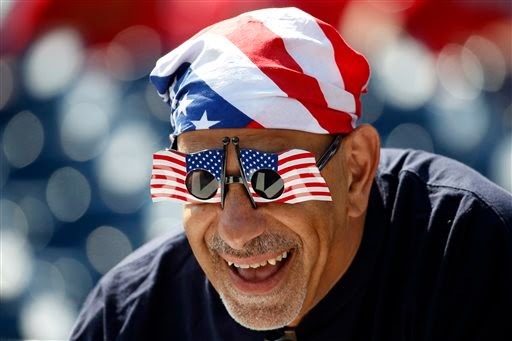 But nobody connected to major league baseball — or any other big-time American sport, for that matter — has any right to claim soccer games take too long. Big-time American sports are all about finding, even creating, interruptions in the contest and exploiting them to sell stuff on the broadcasts. The gap in baseball between innings has been stretched to the breaking point, particularly on nationally televised games. Football invented a superficial automatic timeout for ads, the "two-minute warning." (What, the coaches are so absent-minded they don't know how much time is left?) The last "two minutes" of basketball games can take a half-hour to complete in the hands of expert coaches. Ned Yost thinks soccer games take too long? All the glass in his house deserves to be stoned.